This collection includes all issues of the Western Illinois University Bulletin from 1903 through 1959. The Bulletin was an official publication of WIU and contained course catalogs and other information about Western, as well as serving as a publishing venue for WIU faculty. 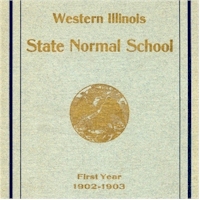 First published in 1903 as the Western Illinois State Normal School Quarterly, the name changed to The Bulletin in 1943. It was published regularly through 1959 and then sporadically until 1972. In it you can find articles by faculty on teaching and other subjects, facts about the University, course listings, and detailed descriptions of programs offered by Western. It documents the history of WIU as well as the history of teaching in Illinois. ©2011 Western Illinois University. All Rights Reserved. Collection may be protected by copyright. Do not copy or redistribute in any form without permission.